Ok so i am yet to even go to Japan and actually this is a recipe i picked up in New York. I had this in one of New Yorks many amazing food courts and instantly wanted the recipe. Though the best i could get was a snapshot of the ingedients list I have made it enough times to know that it is spot on. I'm not really a salad guy but there is something so fresh and mourish about this one. It's all in the dressing! Boil the noodles. A bowl of noodles needs about a bowl and a half of the rest of the ingredients. Flush it with cold water, stir in some sesame oil and set aside. Prepare the squid and marinade it in a mix of sesame oil, soy sauce and rice vinegar. Grill or griddle the squid (I prefer this way to get a bit of colour on the squid. Slightly charred squid tastes amazing!). Cook it for too long and it will go rubbery so be careful. Slice the squid and set aside to cool. Boil the sugar snaps, baby corn and/or aspragus and flush with cold water. Slice the peppers, cucumber and the spring onions. For the dressing you need to grind the sugar, garlic, ginger, sesame seeds and the sesame oil into a paste. I use a pestle and mortar but i'm sure some kind of blender will do the job. Mix up this paste with the vinegar and soy sauce. Put the noodles, salads, veggies, prawns... everything into a big bowl, pour over the dressing and mix it all up. It is far easier to toss the salad with a clean hand. Throw on some more sesame seeds for show if you wish. Dish up, eat, enjoy and feel healthy. 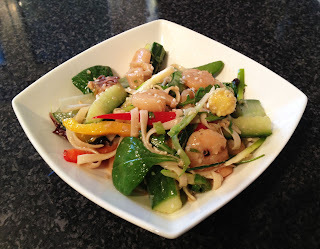 Japanese inspired via New York Squid, Sesame and Soy Salad.